The Embalmer by First RUN Features at Chocolate Movie. MPN: 720229911023. Hurry! Limited time offer. Offer valid only while supplies last. Peppino (Ernesto Mahieux), a taxidermist who stashes contraband in corpses for the Mafia, may be undersized, but he shouldn't be underestimated. Peppino (Ernesto Mahieux), a taxidermist who stashes contraband in corpses for the Mafia, may be undersized, but he shouldn't be underestimated. After Peppino persuades the handsome Valerio (Valerio Foglia Manzillo), a waiter of heroic proportions, to be his well-paid assistant, he shows his new protégé a good time by hiring prostitutes to entertain them both. But Peppino's eyes are not on the girls...and Valerio's new girlfriend Deborah (Elisabetta Rocchetti) knows it. The battle for Valerio's affections are about to take a deadly turn. Garrone has entered complex, mature territory that pulls from classic film noir to create an underlying sense of dread in this beautifully shot, dramatically riveting character study. He started with a simple question: How does a man who isn't especially rich or good-looking seduce a young, handsome man, who doesn't happen to be homosexual? To answer this question Garrone created three compelling characters and a well-crafted screenplay that keeps the audience wondering why the tall and beautiful Valerio stays with the crafty, diminutive and possibly dangerous Peppino. THE EMBALMER was selected for Cannes Directors' Fortnight in 2002 and the prestigious New Directors/New Films series at Lincoln Center in New York in 2003. It won two David di Donatello Awards (the Italian 'Oscars') in 2003 for Screenwriting (to Matteo Garrone) and Best Supporting Actor (to Ernesto Mahieux). 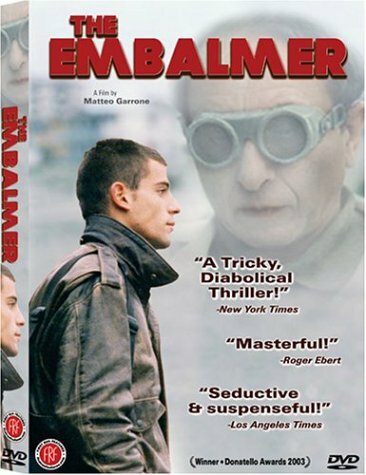 Though THE EMBALMER is a stylistic leap from Garrone's earlier work in a documentary style, he continues to focus on the lives of those on the margins of society as he creates compelling psychological portraits, and in the process weaves together intriguing questions pertaining to the interrelatedness of power, love, desire and violence. If you have any questions about this product by First RUN Features, contact us by completing and submitting the form below. If you are looking for a specif part number, please include it with your message.